To summarize, 2.7 is much faster than 2.6 and handles its metadata and multilingual content much better. 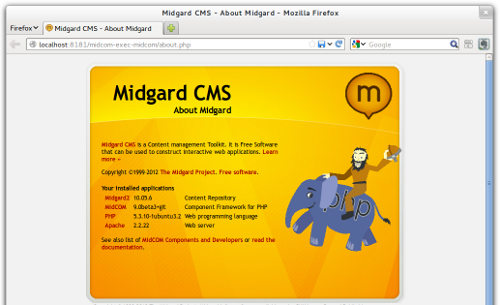 It also requires Midgard 1.8.1, due to be released soon. 31 July 2012 in Berlin, Germany. 10 minute read. For those who haven’t been following the Midgard-land, there have been some interesting developments recently. The long-term supported Ragnaroek branch of Midgard1 is slowly fading away, and much of the recent activity has focused on making Midgard2 available via the PHPCR standard, and on the new Create.js inline editing tool. 08 September 2008. 1 minute read.